Take Action! – We need a national housing strategy now! Join our collective voices across Canada to call for a national housing strategy now! We have an affordable housing and homelessness crisis in Canada and the government has done little to fix it. The new Liberal government campaigned with a promise to fix our affordable housing crisis and we will hold them to this. 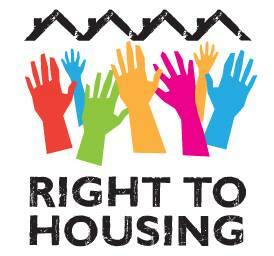 We are calling for the government to ensure that everyone has the right to safe, adequate, affordable housing. Send a strong message across the country: we want a rights-based national housing strategy now! In Canada, we have 150,000 to 300,000 people who are visibly homeless, and 450,000 to 900,000 people among the “hidden homeless.” Meanwhile, the waiting list for social housing continues to grow: there are over 168,000 households on the waiting list in Ontario alone. In 2009, Miloon Kothari, the UN Special Rapporteur on Housing, called the housing and homelessness crisis in Canada a “national emergency.” Homelessness costs the Canadian economy $7 billion annually (including emergency shelters, social services, healthcare and corrections). Yet, Canada remains the only G8 nation in the world without a national housing strategy, and the federal government continues to cut funding to housing and homelessness programs. The crisis is about to get worse. Social housing is the safety net that houses those who might otherwise be at risk of homelessness. In Canada, 365,000 low income households are at risk of losing their homes because the federal government refuses to renew subsidies for social housing. Without federal government support, many providers of social housing will have to raise rents to market levels or sell their affordable units to make ends meet. Residents that can’t pay the higher price will face economic eviction. We are calling for the federal government to ensure that everyone has the right to secure, adequate and affordable housing. We need a rights-based national housing strategy that is adequately funded and is developed in consultation with all levels of government (including First Nations, Métis governments, and Inuit Land Claim Organizations), key community stakeholders, and individuals experiencing homelessness or living in precarious housing situations.